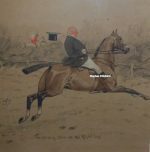 The Rosa Bonheur Engravings, Prints and Pictures below represent a small selection of works available. If there is anything by Rosa Bonheur that you’re looking for not listed here, then please contact us on 07889 800857. Bonheur was born on 16 March 1822 in Bordeaux, Gironde, the oldest child in a family of artists. Her mother was Sophie Bonheur (née Marquis), a piano teacher; she died when Rosa Bonheur was eleven. Her father was Oscar-Raymond Bonheur, a landscape and portrait painter. The Bonheur family adhered to Saint-Simonianism, a Christian-socialist sect that promoted the education of women alongside men. Bonheur’s siblings included the animal painters Auguste Bonheur and Juliette Bonheur and the animal sculptor Isidore Jules Bonheur. Francis Galton used the Bonheurs as an example of “Hereditary Genius” in his 1869 essay of the same title. Rosa Bonheur moved to Paris in 1828 at the age of six with her mother and siblings, her father having gone ahead of them to establish a residence and income. By family accounts, she had been an unruly child and had a difficult time learning to read, though even before she could talk she would sketch for hours at a time with pencil and paper. Her mother taught her to read and write by asking her to choose and draw a different animal for each letter of the alphabet. The artist credits her love of drawing animals to these reading lessons with her mother. At school she was often disruptive, and she was expelled from numerous schools. After a failed apprenticeship with a seamstress at the age of twelve, her father undertook to train her as a painter. Following the traditional art school curriculum of the period, Rosa Bonheur began her training by copying images from drawing books and by sketching plaster models. 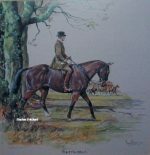 As her training progressed, she made studies of domesticated animals, including horses, sheep, cows, goats, rabbits and other animals in the pastures on the perimeter of Paris, the open fields of Villiers near Levallois-Perret, and the still-wild Bois de Boulogne. At fourteen, she began to copy paintings at the Louvre. Among her favorite painters were Nicholas Poussin and Peter Paul Rubens, but she also copied the paintings of Paulus Potter, Frans Pourbus the Younger, Louis Léopold Robert, Salvatore Rosa and Karel Dujardin. She studied animal anatomy and osteology in the abattoirs of Paris and by dissecting animals at the École nationale vétérinaire d’Alfort, the National Veterinary Institute in Paris. There she prepared detailed studies that she later used as references for her paintings and sculptures. During this period, she befriended father-and-son comparative anatomists and zoologists, Étienne Geoffroy Saint-Hilaire and Isidore Geoffroy Saint-Hilaire. A French government commission led to Bonheur’s first great success, Ploughing in the Nivernais, exhibited in 1849. Her most famous work, the monumental Horse Fair, measured eight feet high by sixteen feet wide, and was completed in 1855. It depicts the horse market held in Paris, on the tree-lined boulevard de l’Hôpital, near the Pitié-Salpêtrière Hospital, which is visible in the painting’s background. This work led to international fame and recognition; that same year she traveled to Scotland and met Queen Victoria en route, who admired Bonheur’s work. In Scotland, she completed sketches for later works including Highland Shepherd, completed in 1859, and A Scottish Raid, completed in 1860. These pieces depicted a way of life in the Scottish highlands that had disappeared a century earlier, and they had enormous appeal to Victorian sensibilities. Though she was more popular in England than in her native France, she was decorated with the French Legion of Honour by the Empress Eugénie in 1865, and was promoted to Officer of the order in 1894. Art dealer Ernest Gambart (1814–1902) represented her; he brought Bonheur to the United Kingdom in 1855, and he purchased the reproduction rights to her work. Many engravings of Bonheur’s work were created from reproductions by Charles George Lewis (1808–1880), one of the finest engravers of the day. Women were often only reluctantly educated as artists in Bonheur’s day, and by becoming such a successful artist she helped to open doors to women artists that followed her. 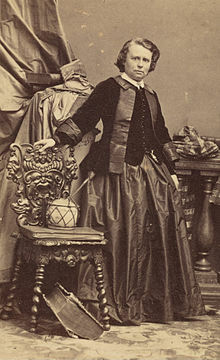 Bonheur can be viewed as a “New Woman” of the 19th century; she was known for wearing men’s clothing, but she attributed her choice of trousers to their practicality for working with animals (see Rational dress). Bonheur died on 25 May 1899 at the age of 77, at Thomery (By), France. Many of her paintings, which had not previously been shown publicly, were sold at auction in Paris in 1900. One of her works, ”Monarchs of the Forest”, sold at auction in 2008.